Ten years ago, Rich Weber and Jamsheed Agahi surveyed an industry they knew well – they each had 10+ years’ involvement in the technology – and found no one was providing hardware/software interface solutions. So in February 2006, they founded a company to “provide good solutions to the industry” and got busy coding. They had their software up and running by DAC, held that year in San Francisco, were featured in the July 2006 issue of EETimes, and were working with their first customers by the end of the year. When we spoke by phone this week, I asked Rich Weber about the company’s story since 2006. He said, following Semifore’s dramatic start in 2006, “We discovered in 2007 that people were very interested in standards, open standards in particular, so we started our efforts to support SystemRDL. The momentum of those early days notwithstanding, Weber referenced the difficult next year when the world economy was struggling through the Great Recession: “Nothing great happened in 2009, except during that time the SystemRDL and IP-XACT standards were published. “By 2010, however, orders for our software started coming in and we began adding the larger customers to our list. The lawyers tell me I can’t actually tell you who those customers are, but we have been adding customers and growing every year since 2010. “Today, I can assure you that there is something in your home or your pocket that [has features] generated by our CSRCompiler. Ours is a ubiquitous presence – in the consumer area, in aeronautics, in military applications, in gaming platforms, in the gadgets one wears on one’s person, and in networking. I asked Weber to expound on his company’s May 23rd announcement, the motivation for our phone call. He said, “We’re announcing our CoStar Design Director Platform, which includes the CSRCompiler, the CSRSpec Language, and the CSRConfigurator. “Our CSRCompiler processes standard languages. In addition, a lot of our customers have a background of using spreadsheets, but our compiler can read and write Excel spreadsheets, so it is very powerful there. “It also works with all of the standards. It can read and write all versions of IP-XACT, both input and output, and can read SystemRDL and UVM. We have been active on all of the committees [that have developed these standards], and our customers find that very helpful – particularly if they need to change formats [mid-design]. “Importantly, it’s not just a translation unit, it also builds a data model and more than a thousand schematic checks. Our compiler is actually capable of automatically generating RTL – some of customers use our compiler to generate up to 20 percent of their die. Addressing other aspects of the CoStar Design Director Platform, Weber said, “Our CSRSpec Language has been growing ever since we created it 10 years ago. It’s [is a super-set of] SystemRDL, UVM, and IP-XACT. CSRConfigurator is also part of the newly announced platform, per Weber: “Each customer has special needs, and tools today often look to script writing as a way to customize to those demands. It’s the traditional way of doing things. “But we have never thought that was an efficient model, so we don’t have application engineers; CSRCompiler can do the output natively – no script writing is required. “However, for documentation output customers still have special requirements. So rather than having a script written one way or another, we decided to put ‘knobs’ on our CSRCompiler – today there are over 400 knobs – with the idea that Semifore does the heavy lifting inside the compiler and the customer just has to turn the knob. “This CSRConfigurator capability is very important, and allows customers to customize to their specific needs with all of the maintenance done by us. “So these are the three legs of the stool put together into our platform,” Weber concluded. “We’re not a traditional EDA tool, products that are either targeted at RTL designers or RTL verification engineers. “Our platform helps all of our customers be more productive, because our tools have a much broader [impact] across the organization. Every company designing a digital device needs the hardware/software interface information to be made available to the RTL engineers and architects, the verification engineers, and those who write the device drivers. “Clearly the niche we fit in is very broad. We touch practically every part of the organization except accounting,” Weber chuckled. Given the company’s 10-year anniversary, I asked Weber if Semifore would be having a party at DAC to celebrate. The CoStar (Configuration Status Register) Design Director Platform provides hardware and software design functionality and behavioral abstraction not available in any other commercial offering or industry standard. It provides multi-language support without the need for specialized interfaces or additional scripting to significantly improve designer productivity and interoperability efficiency as much as 70%. CoStar Design Director incorporates an agile design process to ensure best practices and early engagement by the entire design team. 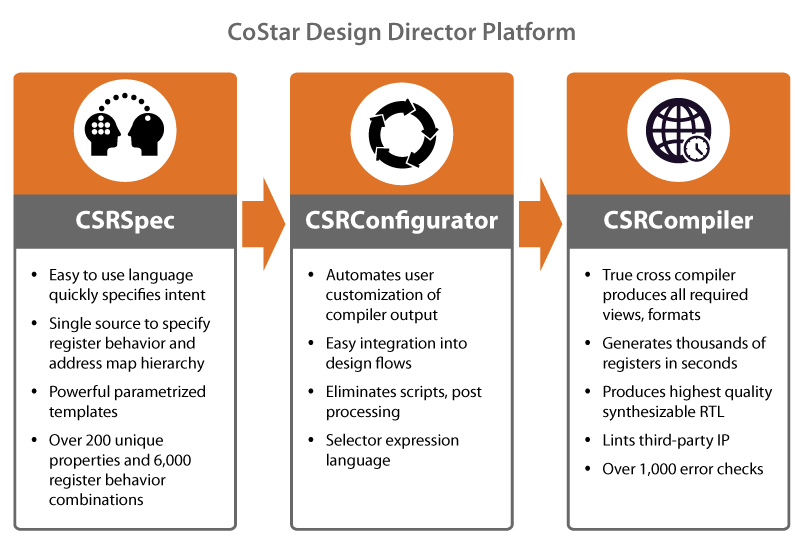 Built on innovations used to specify register behavior and address map hierarchy, CoStar Design Director encompasses three innovations: CSRCompiler, the CSRSpec Language and CSRConfigurator. The platform supports internal proprietary formats and industry standards. Based on customer requests and requirements, Semifore broadened its standards support to provide features and functions not available in UVM, IP-XACT, and SystemRDL. Per CEO Rich Weber, “Semifore was founded by designers for designers. Having experienced firsthand the limitations of internal scripts, I understand the challenges faced by designers. CAD Tools: No longer agnostic w.r.t. end-product systems? This entry was posted on Thursday, May 26th, 2016 at 8:08 pm. You can follow any responses to this entry through the RSS 2.0 feed. You can leave a response, or trackback from your own site.